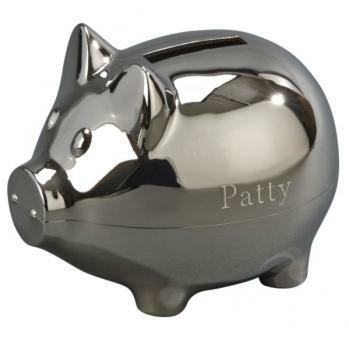 Make saving fun again with our classic piggy bank! won't need to spend time polishing it, instead you will be able to spend time counting your money. Plug at bottom to remove money. The bank can be engraved with a special name, date or message for any occasion. The pig bank measures 4.25" high x 4" wide x 5" long. The slot to insert money is located on the top of the pig's back. You will love the details such as the ears, nose, eyes and tail.